Are you looking for a small ship cruise that mixes the best of history, sun, fun and relaxation? 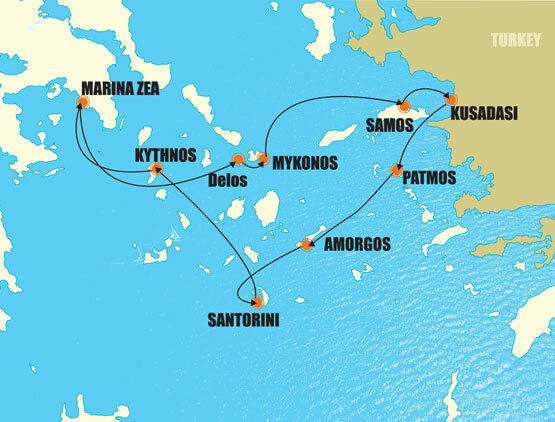 The Triton small cruise vacation has you cruising around the Aegean over eight days and seven nights, taking the in the splendours of Santorini, the traditional Kynthos and Samos as well as the archaeological wonders of Delos and Ephesus. Your luxurious cabin has an en suite, air conditioning and many other conveniences as well as sun decks and a restaurant that serves fine cuisine. The cruiser, the Sail Cruiser Panorama, caters for no more than fifty people. This island cruise vacation has something for everybody. Embarking at Marina Zea, a port in the south of Athens between two and three in the afternoon, you will be greeted by the crew and shown to your cabin. As you enjoy a welcoming cocktail, the boat will make its way out of the port, passing the majestic Cape Sounion with the Temple of Poseidon at its helm. This will be a good opportunity to meet your fellow ship mates as the boat makes its way to the island of Delos overnight. Cruising through the night, you will arrive early in the morning at Delos Island, where you will have the option to visit this mystical and ancient island on an optional excursion. Delos is the traditional birthplace of the gods Artemis and Apollo. An ancient trading port, Delos was left uninhabited over a thousand years ago, but the ruins, mosaics and excavations are magnificent. Delos is a true open-air museum and the optional tour is one well worth taking. After returning to the boat and lunch, you will sail to the nearby island of Mykonos, firstly, for a stop in one of Mykonos's magical bays for a swim, and then on to the mail port, where you will disembark and enjoy this very cosmopolitan town and all its delights. Mykonos has some of the best shopping in the world. It is also one of the best places in the world to watch the people go by as you dance away the night. The narrow streets with their colourful balconies are maze like and you can spend hours wandering around happily getting lost, running into the odd pelican on the way. During the evening, take in a meal at any one of Mykonos's international restaurant or have mezes and ouzo at a local taverna. Make your way back to the boat at your leisure - so the option is there to dance the night away in one of Mykonos's clubs. Just make you return for the early sailing the next morning. The boat leaves Mykonos at daybreak, setting sail for the first stop at Lipsi. Here there will be a swim stop and a barbeque lunch served on deck. In the afternoon, the boat sets sail for Samos, part of the Aegean Islands and very close to the Turkish coast. The boat will moor in Samos overnight. Here you will have the opportunity to visit the town and wander the town and make the most of this relaxing day of sailing, sunbathing and relaxing. 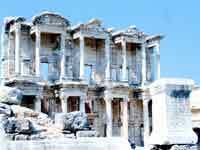 Today's touring takes you to Kusadasi in Turkey to visit the ancient site of Ephesus. This is one of the greatest archaeological sites in the world, a true representation of ancient times. You can take the optional tour around the site, your English speaking guide explaining to you about life in this ancient city. Imagine yourself as you walk down the main road, taking the same path made by Cleopatra and Mark Anthony over two thousand years ago. After your visit to Ephesus, there will be some free time in Kusadasi, visiting the bustling market, a great place to pick up leather goods and carpets. Once this visit is over, it's back on the boat for your sailing to the spectacular island of Patmos. Overnight at sea. Arriving in Patmos in the early hours, you will wake to find yourself in the beautiful surroundings of Patmos Town, with its winding cobbled streets and whitewashed houses. There is an optional excursion you can take to the Grotto and Monastery of St John, where the saint wrote the book biblical book of Revelations. For those who don't wish to take the excursion, wander the cobble stone streets and make the most of your time in the Chora. After lunch you will once again board the boat for the sailing to the traditional island of Amorgos, the site where the movie, "The Big Blue" was filmed. Overnight in Amorgos. Early in the morning the boat will set sail for Ios, where you will swim at Manganari Beach, known as one of the most beautiful beaches in the country. Later in the morning, the boat sails for Santorini, with its high cliffs, stunning views and active volcano in the centre of the caldera. Mooring at Fira, there is an optional walking tour of this wonderful town, with its white buildings that sit high on the cliffs. Along with a visit to the Prehistoric Museum, later in the day you will be taken to the town of Oia, in the North of the Island to witness what is known as the most amazing sunsets on earth. Returning to the boat after sunset, the boat will stay in Santorini for the night. The boat will sail early in the morning for the island of Kynthos. This is your last day on the boat so make the most of your time relaxing on deck. 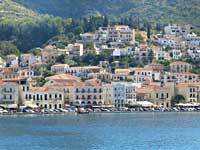 There will be a swim stop at Kolones Bay on Kynthos before the afternoon sailing back to Marina Zea. The boat will arrive in Athens late in the afternoon and your final evening will be spent moored at Marina Zea. This evening is your last chance to enjoy the company of your fellow shipmates with the dinner onboard. After breakfast, it's time to disembark the boat, saying goodbye to your fellow travellers and the crew. Please speak to us about arranging transfers to your next destination whether that be a hotel in Athens or back to the airport for your flight home.